If you are conducting a class or group activity, you should consider preparing all servos ahead of time. The micro:bit provides just enough current to operate the SG90 microservo. This servo requires 3 connections: GND, 3V and a logic pin. In this tutorial, we will equip the servo with crocodile clips to make it easier to use. However, you could also use a shield or crocodile clips with a male connector on one end to achieve the same result. To better understand how servos work and how they are controlled, take a few minutes to read this Brief Guide to Servos. 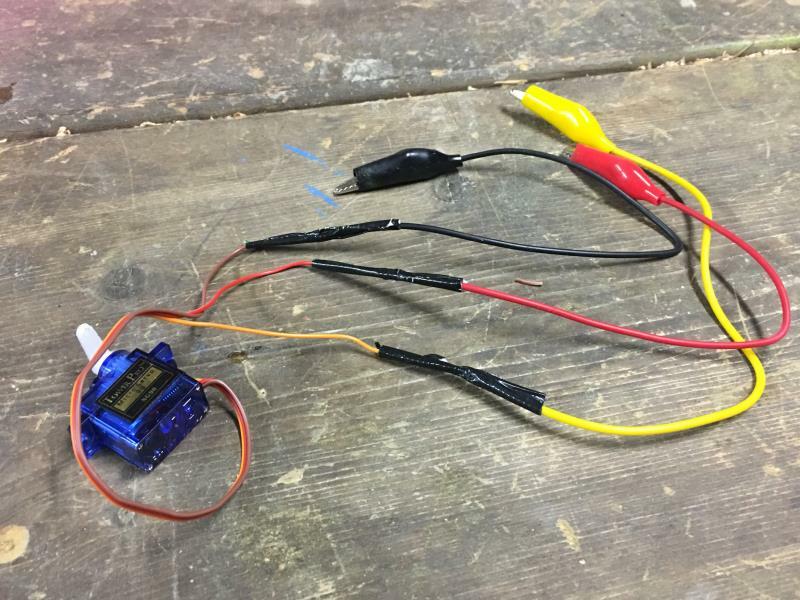 The easiest way to connect a servo to the micro:bit is to use cables with an Alligator/Crocodile clip on one end and a Male jumper (pig tail) on the other end. You can purchase bundles these cables from various electronic resellers or easily build some as shown here. 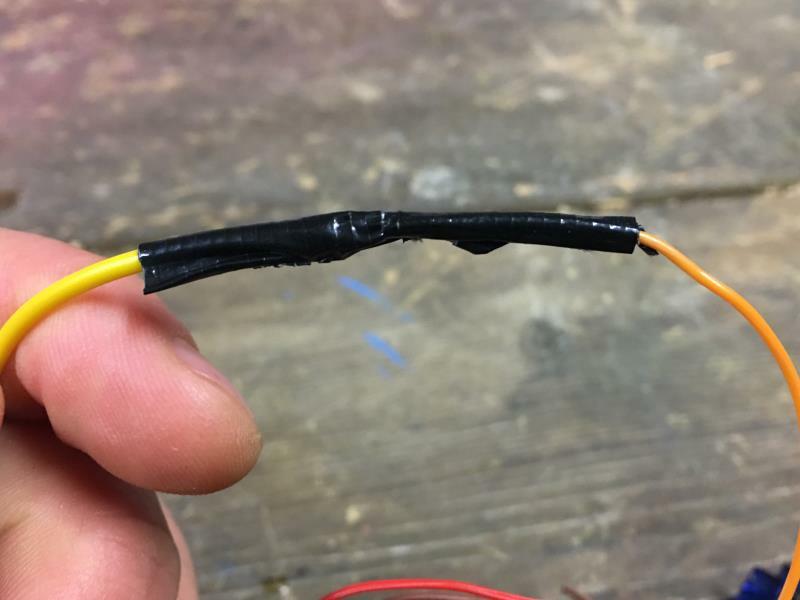 Simply cut the cables, strip them, twist the bare wires together, and cover the connection with some heat shrink tubing. It is very important to ensure a good connection between the 2 cables. If the connection is weak, the microservo will not receive enough current and it will not work. 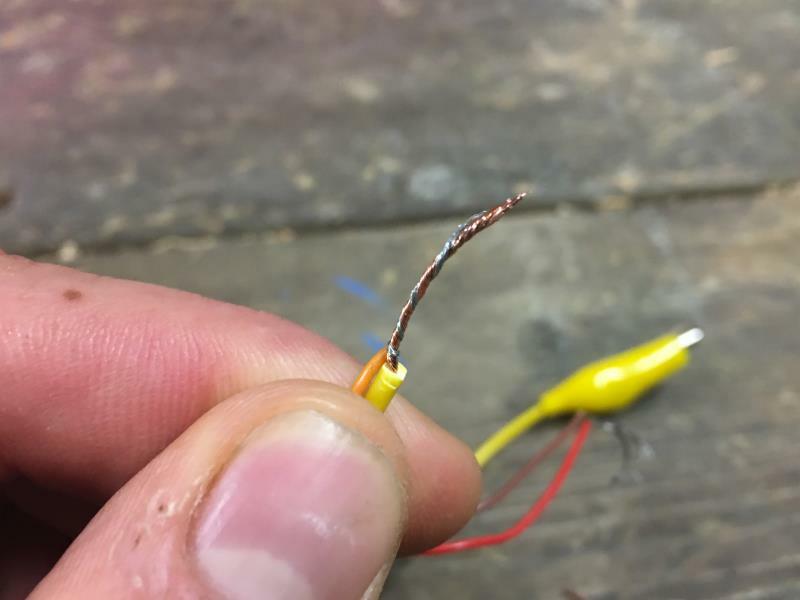 If you have access to a soldering iron, we strongly recommend that you solder this connection. You can also connect your crocodile clips directly to the servo. 3 crocodile clips, yellow, red and black. 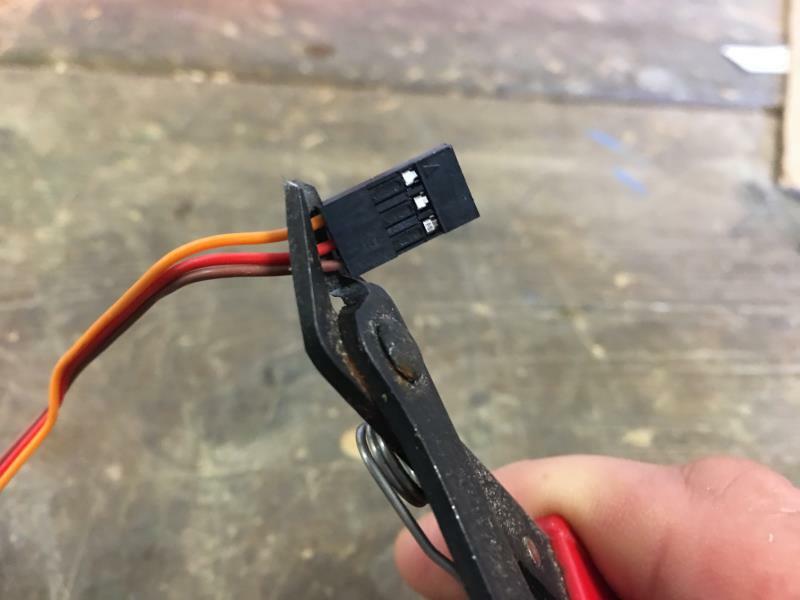 With the cutting pliers, cut off the dark plastic connector. Using the pliers or a wire stripper, strip the plastic insulation from the cables. Twist the strands of bare wire at the ends of the servo cables together. Cut a crocodile cable in two and strip off the insulation. If it’s possible, try to use cables with colors that match the cables on the servo! … and thread them together. 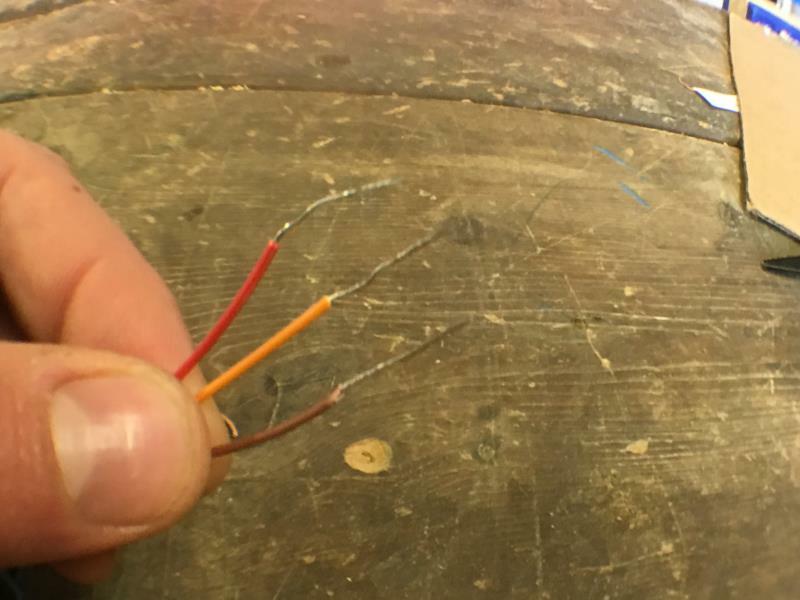 It is very important to ensure that there is a good connection between the 2 cables. 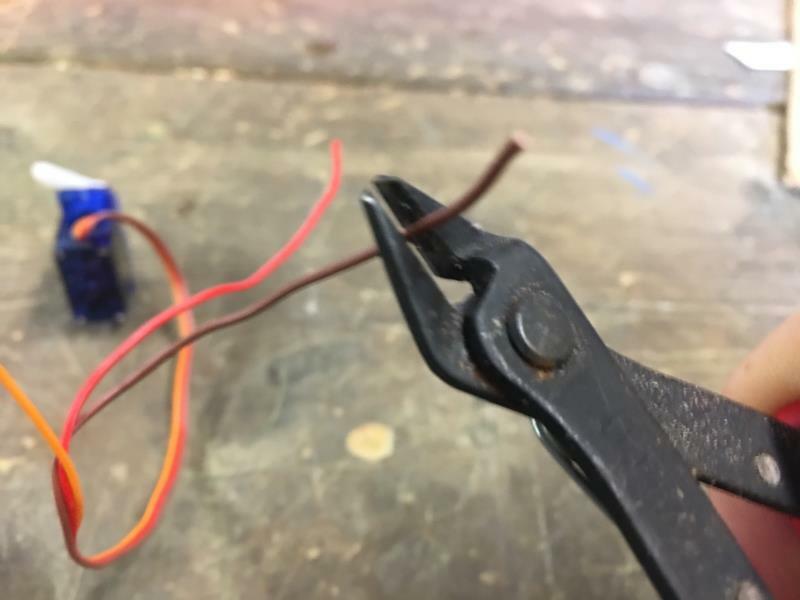 If the connection is weak, the microservo will not receive enough current and it will not work. 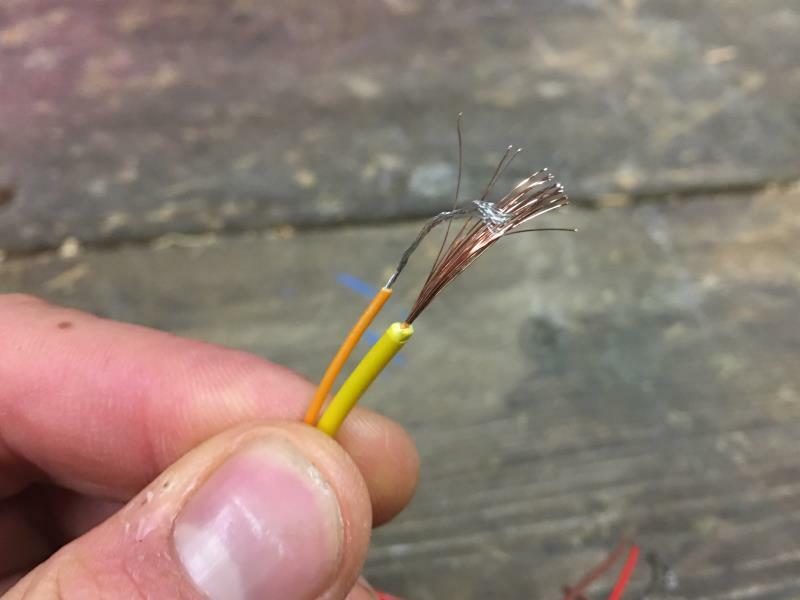 If you have access to a soldering iron, we strongly recommend soldering this connection. 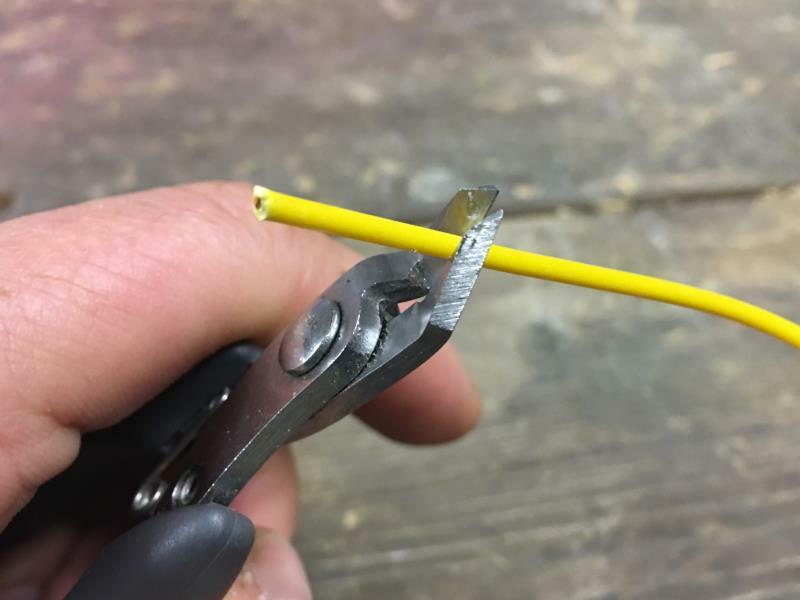 Protect the connection with heat shrink tubing, electrical tape, or duct tape. Repeat the same process until all cables are connected. It’s time to test and find out if your connections are all secure and that the servo will function when the micro:bit is powered by battery. 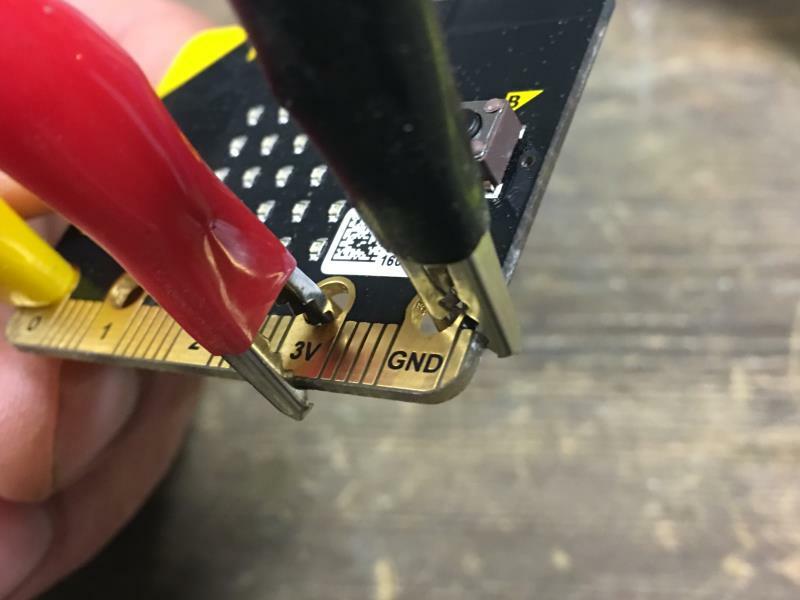 Connect the microservo cables to these pins on the micro:bit: black to GND, red to 3V, and the remaining cable to pin 0. When attaching the crocodile clips to the pins, don’t be afraid to clamp on to the edge of the board with the clips. 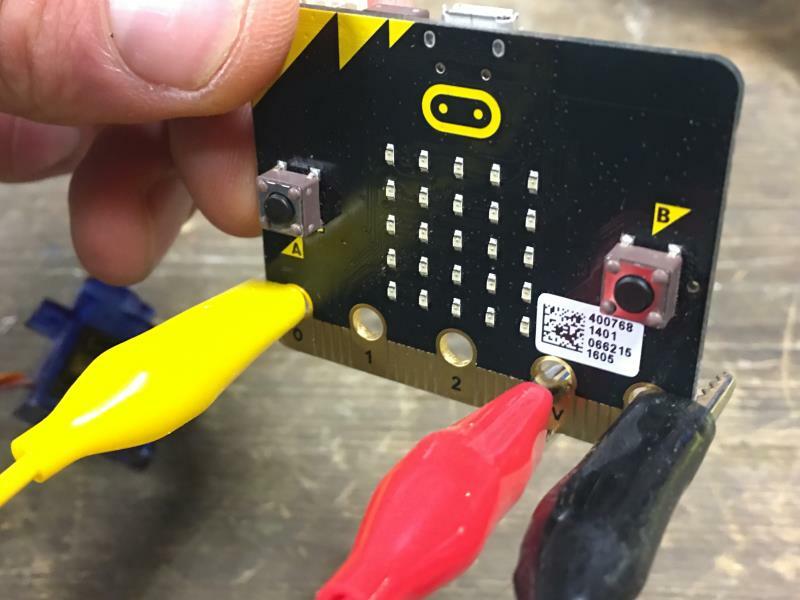 Download the following code to your micro:bit. Powered by batteries only and not connected with USB. Use the servo calibrator program to determine the best angles to use for your make. If your servo seems to stutter and remain stuck at a particular position, it means that it’s not receiving enough power. This is probably due to a weak connection or low battery level. Make sure that each connection is good and check your batteries.